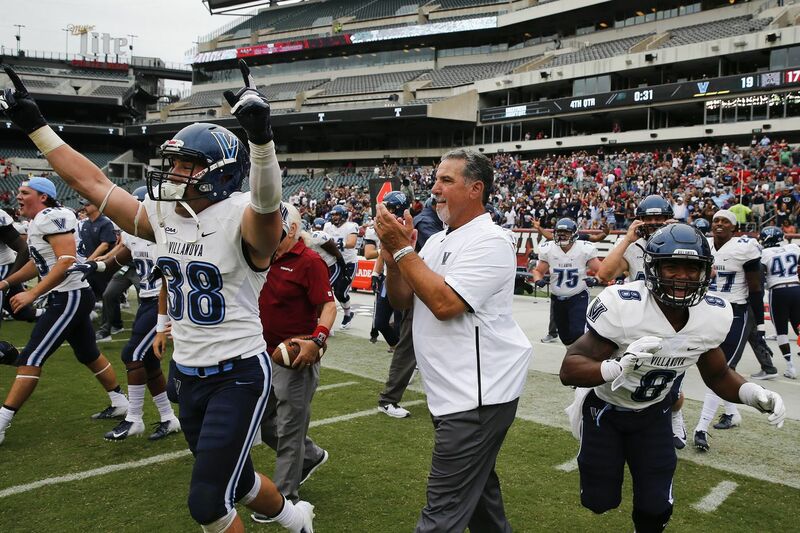 Villanova football coach Mark Ferrante turned the corner into the visitors' locker room at Lincoln Financial Field Saturday afternoon and it looked like a celebratory receiving line, all of Ferrante's assistants in there shaking hands, the head man the last one in. There was a formal look to all the hand shakes. Job well done, that kind of thing. The locker room just beyond already had escalated into bedlam, Villanova's players jumping around. "I can't tell you how much this means to our program,'' Ferrante said later. Final score: Villanova 19, Temple 17. To say the Wildcats had earned it is an understatement. The truth: When Villanova was losing, it deserved to be winning, and this one seemed destined to be decided by the last crazy play. In the end, it was decided by the team that kept making more plays. Even when Temple had a couple of chances to get down the field and save the day, a pair of Villanova interceptions took care of that. If you're a "same old Temple" kind of cynic, don't be. Temple is picked third in the American Athletic Conference East. The Owls have long since proven their legitimacy. They just didn't deserve this one. Yes, they have a lot of work to do. Yes, that third-place prediction looks optimistic right now. Just don't do the "same old Temple" thing. It's disrespectful to both of these programs. Saturday's biggest big play came after Villanova, trailing, 17-13, had moved on Temple, with yet another third-down conversion, a couple more big passes, but then it looked as if the Wildcats were stalled. A 1-yard run on first down, incomplete passes on second and third. So here was fourth and 9 from Temple's 30-yard line. The Owls nearly brought the house at 'Nova quarterback Zach Bednarcyk, who rolled to his left, scanning for an escape valve, knowing it had to be downfield. "I knew I'd probably have to roll out of the pocket, so I took a little three-step and just rolled out to my left, gave myself a chance to throw it to somebody,'' the senior said. Bednarcyk had been back as far as the 45-yard line being chased, before he saw receiver Jarrett McClenton. "Jarrett said he saw me the whole time so he came around — you saw the rest,'' Bednarcyk said. "Once I cleared the [defensive] end, and I knew I had a little bit of room, I saw him. I just had to figure out a place to put it. There was a guy on him, defending him pretty well. So I had to find a spot to put it. He did a great job." "I just had to keep playing,'' said McClenton, who crossed the field and got behind his defender, then found open ground for the 30-yard game-winner. First drive of the game, Villanova had driven like Temple wasn't there. The Wildcats shredded the Owls again for a 13-3 lead, after a missed extra point. Temple finally held after Villanova had moved again — actually had a first down at Temple's 11, threatening to bury the Owls early. Except Quincy Roche came through with a field goal block and Kimere Brown picked it up and took it 76 yards to the end zone. Could a FCS team playing one level up overcome this kind of momentum buster? A third-quarter TD put Temple ahead even though after three quarters Villanova had 307 total yards to 183 for Temple. The time of possession after 45 minutes was 27 minutes and 25 seconds for the Main Liners, 17:35 for the Broad Streeters. "We knew we could get on the edge,'' said Villanova defensive end Malik Fisher, explaining how Temple had some linemen with increased responsibilities. "We knew we would have chance to get at them with a lot of movement, things like that. I wouldn't say it was easy, but it was easy to get in their heads a little, so they seemed a little tentative." If Villanova had the experience edge, Temple should have the edge in depth. When Villanova safety Julian Williams was asked to leave after a spearing foul, his replacement was Chucky Smith, a walk on. His last 40 was a 4.68 — "probably slower now,'' he said later. "Chuck's awesome,'' Ferrante said. "He's in the ROTC program, I believe, with our Navy. I'll see him come in a half hour before practice and run three miles. … Guys like that are invaluable to have on your roster when something like today happened." Smith had gotten to the locker room just before Ferrante. Some friends outside in the hallway saw him, yelled MVP. "Definitely not me,'' said Smith, although he did have four tackles, including a key late special-teams bring down, more his normal role. What the walk-on did know: "Everyone in the tunnel" knew this was possible, Smith said, speaking of how the visitors approached this one after losing to Temple last season on a late field goal. "This wasn't some vague FCS team. We couldn't just play with them, we could beat them."